Use this easy patchwork quilt pattern to make 6-inch Cracker quilt blocks. Each block is with two fabrics, but feel free to work with more fabrics if you wish. Eight blocks are illustrated in the photo above to give you a feel for one potential layout. Do keep in mind that you can create a completely different look with your blocks by simply shifting the arrangement. To make quilt blocks like the illustration, choose a dark fabric for the focal area and surround it with a white-on-white or neutral background. Cracker blocks would look fantastic if you reversed contrast―perhaps placing very bright fabrics against a black background. Cracker blocks make lovely scrap quilts, but can be just as effective when sewn in an orderly theme. we'd love to see a watercolor style quilt made from the block. To make the cracker quilt block, three bars are sewn together to create a square center unit, and then triangles are added to each side of the bar group. One caution: the bars are cut 1-15/16" wide, halfway between the 1-7/8" and 2" lines on a rotary ruler. Estimating the distance works just fine, but you'll find a few alternatives in the Cracker quilt pattern, a 60-block layout. Before we get started―wouldn't this make a cute baby quilt or kid's quilt? The Cracker block is a nice size―not too big and not too small―and it lets you showcase all sorts of scrappy fabrics. See page 3 for an example of Cracker quilt blocks sew into rows. Cut each of the 3-7/8" squares in half once diagonally to produce two triangles. Sew the three bars together lengthwise, with the white on white strip in the middle. Press the seam allowances towards the bright bars. The finished unit should measure 4.5 inches square. Center and sew a bright triangle to the bar unit, arranging it to flow across the end of a patchwork bar unit as shown. Press the seam allowance towards the triangle. Repeat on the opposite side. Center and sew a white triangle to the remaining sides. Press the seam allowances towards the pieced bar unit. Your Cracker quilt block should measure 6-1/2" x 6-1/2". If it doesn't, check to make sure your strips were cut to the correct width. If your block is slightly smaller, try sewing the next block with a scant 1/4" seam allowance. 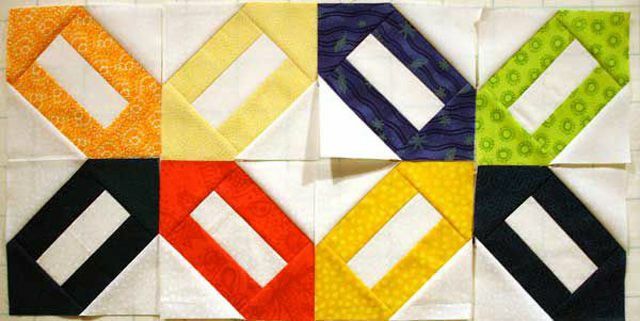 Here, Cracker quilt blocks are arranged in groups of four in a straight setting.